The Special Operations and Response Team (SOAR) is comprised of deputy sheriffs who are trained to handle a variety of specialized tasks. Each team member is highly skilled in special weapons and tactics (SWAT). Team members receive continual specialized training to ensure they maintain appropriate proficiency levels. Members are called upon to successfully resolve crisis situations involving incidents such as armed, barricaded suspects and hostage situations. This tactical team minimizes the liabilities associated with armed confrontations. When not responding to incidents requiring a SWAT call-out, SOAR responds to other county law enforcement needs, including high-risk warrant services. 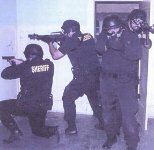 The execution of certain warrants by conventional enforcement techniques might expose deputies to extreme and unnecessary danger. However, the SOAR team's primary purpose in all operations is risk reduction. While the team cannot totally eliminate risks, it has formulated a network of procedures that overcomes dangers with the use of special equipment, weapons, training, and sound tactical operational plans. The SOAR team is also called upon for marijuana stakeouts and eradication. They endure heat, snakes, spiders, and ticks while still looking out for potentially armed growers and booby-trapped gardens. For more information about the SOAR team, please contact the sheriff's office at (530) 458-0200.